and, in this case, NBUS! I have written prior posts on the origin of April Fool's Day, the origin of the April Fool's Day Big Fat Boo-Boo Hop and the origin of my NBUS ("never-before-used-schtuff") challenges, so this time, let's just get right to it! Let's think of this event as a three-legged stool. I'm using a stool analogy because of the whole fool thing, fools being dunces, and dunces being made to sit on stools after they've engaged in something duncery. 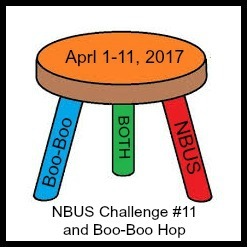 Date: April 1 - 11, 2017.
using something NBUS that also has a boo-boo on it!! No prizes this time except the satisfaction you'll feel and the fun we will all have, so there are no other rules! No other rules means no limit on the number of entries you can link, no limit on the other challenges you can also play in, and no limit on the number of calories you can ingest in sugar or wodka as a result of your boo-boo or from the shock of seeing the size of your NBUS mountain!! Feel free to ask questions using the contact form on the right or to: darnell dot knauss at gee mail dot com. It wouldn't be fair if I didn't give you a coupla zamples now wood it? It might take a sec. Look again. This is the most common boo-boo I think we all do. Or at least I do it pretty often, especially as I've gotten older. Cough. What killed me about the above boo-boo was that I actually cut three of these papers upside down, made three cards, and mailed two of them before I even noticed! Gah! My sweet friends never said a word about me being Past My Prime! I don't think there's too much that can be said that isn't self-oblivious about this one. Except that, no, it didn't take me all the way until I was done before I noticed the boo-boo! I did notice it before I matted it, but I went ahead and made the card up for you, knowing I would be sharing it today! Oh, wait, there's one more boo-boo on the above card. You see that inner black circle? I glued it down upside down which you can see if you look closely at the stitches. I'm for always doing that with those stitched dies for some daft reason. I mean, it's not a big deal, but I do prefer them the right way! Okay, off you go. I'm sure you've started your spring cleaning! And you've uncovered forgotten never-before-used-schtuff which you will now use and share! Have fun! Enjoy!! I look forward to seeing your entries! Thank you!! Your CR looks very busy. Thanks for sharing your boo-boos, Darnell. I actually like the upside down sentiment on your Halloween card. It does seem fitting. Not sure if I have any boo-boos to share. My biggest problem seems to be misplacing elements of cards I'm working on and dropping tiny stamps where I cannot find them. I do have plenty of NBUS schtuff, though, and and am working hard to start using them, so I should be able to sneek in a card or two. SO glad I'm not the only person who does this, Darnell! Just back from Venice so will get my thinking cap on before the 11th! I'm so glad I'm not alone in this category of masterful boo-boos!! I love your entries, especially the upsidedown dsp! I think I have a little bald spot on my head from scratching it so often after looking at the card mistakes I've made through the years! LOL Thanks for the fun challenge, and here's to many more! So much fun today just loved the posts great cards except some minor flaws !! Beautiful boo boo's!!! :D I haven't seen the first one before reading Carol's comment.... :) Now I see that the dsp candles are upside down! But the halloween card is just PERFECT as it is!! Love so much the word upside down in this card, is a lovely trick!!! Thanks for illustration with stool - I got it perfectly! I seem to be getting dimmer in my old age. I looked at the card with the candles and it seemed great to me - until you pointed it out! Thanks for sharing your boo boos. I think I could post something every time I make a card! This is so much fun!! I had to giggle at your Boo Boo's. We all make them, we all are super critical of our own work and 95% of the time, no one but us can see them. I had to look three times at your first card to see that the candles were upside down. giggling!!! I have a lot of NBUS and a trash can full of Boo Boo's, let's see what I can come up with today! Well, I'm just too darned good to make boo-boos (translate as I quickly get rid of the evidence). Have plenty of NBUS so will have a root through. I'm really thinking you found my Halloween card and just posted it on here - even though I tossed it so long ago. LOL! Yes, I do that often too! They're still cute cards though Darlene. Fun challenge and I'll be getting mine up this coming week. Spring Cleaning...is that really a thing? I don't seem to have done that is quite some time. If I do, I'll give you a buzz. Anyway...those two cards are not the worst I've seen. Think they're actually kind of cute. Having just oopsied on a card I'll be sharing later, these two look good. You've gotten me thinking NBUS all the time, Darnell, & I've actually used quite a bit lately--yah! Did save the BD card I made last week & will get it posted soon. I also remembered to take some boo-boo pictures which I'll include in the post. Guess I'm past my prime, too--haha! Why is upside down so easy to do?! Even today, I tied my bow on the wrong side of my die cut for the card I posted in Flickr, but luckily it was easy to move around to the front! Hope you have a great April Fools Day with no Fools in sight--haha! PS--Been hoping The Mister is feeling better! LOL, as my dad would ask, "do you know if you're coming or going?". Thanks for sharing your boo boos. I'll be back later in the week. Oh this is funny! My biggie is having thecard oenon the wrong side!! I almost did it again today!! The cards still ge mailed as I say "smears to you" I almost got lost going into clean my craftroom and now I have a boatload of new supplies! "I always get turned upside down when I have another birthday too!" Fun challenge Darnell dearest - and in fact I like the Halloween sentiment just as it is! Fun boo boo cards Darnell! I've glued stitched dies down backwards too. I kinda like the Halloween upside down. It's like the recipient is getting a trick instead of a treat! Have a beautiful weekend! Well here you go again. I have stamped upside down and attached my front piece on the wrong side of the card so it opens on the left. Gosh I hope I can find something NBUS, hee hee. Upside down so the card doesn't open properly and everytime a batch of cards gets mailed at least a few are upside down. I ignore it. C'est la vie! Thanks for sharing your boo boo's the candles are the best. Hi there! This card was only planned to be submitted as a straight NBUS card. However, just as I loaded it to your site, I noticed that it does indeed have a booboo. The bottom large flower on the left was supposed to match the one on the right. but I have used a slightly lighter shade of aqua for the largest layer of the blossom. Will switch it out later, but chuckled to see that I had actually fulfilled the booboo portion of the challenge as well! How many cards can we submit for this challenge? Me again...your BOoBoo's are so typical for a card maker. Have done both those erros so many times that it made me chuckle to see yours. Totally get how it happens! You make the best boo boo cards! I laughed and laughed WITH you as I was reading. Been a little self-delirious myself at times! It's not a boo boo but a NBUS. Do you want us to limit to one entry this time? I have a boo boo. It didn't make it to a card because I realized that it wasn't fit for one before it got to the card stage. Got a kick out of what you call boo-boos! (now I wouldn't have noticed #1 at all!) And on #2, I rather like the 'back-ways' stitches, more dimension. Design detail, ya know. But I like all the colors, and so happy you kept it to share. It makes me feel better knowing experts like yourself can do things backasswards too, just like I do! And dang it, I don't notice, until I see the picture when ready to post! Thanks for a fun challenge. I see you got some swell NBUS cards in here too! Hope Mr. is doing lots better. Hugs. Yep I've done the first one only last week totally didn't register to link up. Will have to get a pic. It's so good to share and have a chuckle together. Do love your cards. So much fun seeing all the boo boos! And yours are priceless Darnell! The upside down paper LOL. I have done this before, also made cards that are back to front, and several times have stuck a stitched die cut on my card the wrong way around - you are not alone my friend! On most cards, I make a boo-boo of some sort but I cover it up. Even funnier that you sent them and your friends never mentioned it !! How fun are your boo boo cards! and so beautiful! I hope I can manage to participate in this fun challenge! Great boo boo cards. I laugh that you didn't notice the birthday one was upside down until you mailed several of them. And I'm not laughing AT you, I'm laughing WITH you. I've done that before and noticed the boo boo when I go to post the photo to my blog. The upside candles rather look like missiles? Maybe? Have an explosive birthday? No? My favorite boo boo is just to glue the front of the card on upside down. It's okay to send those cards to other stampers because we've all done it. I love your Boo Boo cards, Darnell! I have to admit that it took me a minute to notice the upside down candles, and I never picked up the stitching on your 2nd card...I know it's an 'age' thing for me, what can I say? Dear Darnell, thank you for another opportunity to show our boo-boo's to the whole world. :-) I like your boo-boo cards. Sweet and really simpatic mistakes. No boo-boo's to show this time, but glad to have a chance to use my new goodies! Such a totally fun hop, Darnell!! Thank you for bringing a light-hearted chuckle to us by sharing your boo-boos. I think the upside-down sentiment looks kind of cool that way! You know I wouldn't have noticed that paper was upside down either ... Not till you pointed it out... I guess we are in the same age bracket haha! And lets face it anything can happen on Halloween ... even stamps turning upside down! Love your Boo-boo cards Darnell ! I'm so happy to see that I'm not the only one to do such "stupid" things ! But generally I throw my cards away together with the bad words ! But now I know you have a special challenge for this kind of cards so I will keep them on purpose ! And your halloween card is just so funny like that, I would not say it's a boo-boo ! Thanks for your funny cards and your great challenge Darnell ! You really know how to brighten our days ! Hi Darnell, I too look forward to your AFD challenge - knowing perfectly well we all make some silly boo boos... I really didn't see you upside down candles but I suppose it makes sense they should point upwards... and as for upside down words and back to front cards we're all in that boat I think. Anyway thanks for hosting this challenge and have a fabulous week. Love your boo-boos...specially the upside down sentiment! BTW, I'm so going to CASE this h-ween card! Spring cleaning is definitely in high gear in my room too - looks just as 'tidy' as your room! Thing is, I've yet to purge anything...just keep shuffling the schtuff from one pile to another! Hosting a baby shower for my new great-nephew at our house this weekend so crafting goes on hold...again! Thanks for another great challenge and I absolutely loved your booboos! They made me giggle! I know it's April, but I've been buying new Christmas card supplies and made my card using those. I've notices my Christmas crafting supplies are not that inspiring so I could make myself believe I need new stamps and dies... But I think it was a good call, at least this card was super fun to make! I hope you are well and have a fun weekend! at last I managed to join your challenge. Just had to be a card I was making for you. So I hope you don't mind my showing it before you receive it. Both your Boo Hoo cards are so super and it shows that someone as wonderfully talented as you can also make mistakes. I must be getting really old as I don't remember the 1st challenge perhaps that was my Boo Hoo not remembering. just made another Boo Hoo right in time for the end of this challenge. I can see this challenge is quite a fave with most people. I made up a wedding card for a friend once and didn't realise until I showed her, that I had misread the groom's name. I had spent ages embossing and enamelling the wrong name. Fortunately I could remove the part that had the wrong name on it but the second attempt wasn't quite as good. Fun cards...and of course, I have done the same thing. In fact it was last week! LOL My writing was upside down. Thank again for the challenge! If you think that my entry can't be considered a NBUS, please feel free to remove it, I won't be upset. Too bad all that fun happened while I was on vacation...... But I had fun, too. In fact loads of it as you had seen on FB. Things are slowly getting back to normal!